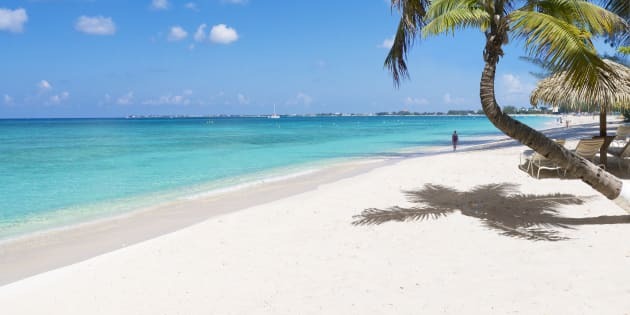 Take some inspiration from Grand Cayman. Where do we get design inspiration? How do we flavour our schemes? Well, for starters, we "absorb" what's around us when on the road or on vacation. Decorative "illumination" might arrive, for example, courtesy of the graphite tones of an industrial Berlin warehouse, a palette we might subsequently play in a client's post-and-beam Toronto loft. Or we might be inspired by the pastel shades of a vintage car in Cuba to colour the lounge in an Avenue and Davenport bungalow. "Aspirational" voyages, you see, afford valuable schematic flavour: while some designers assemble mood boards using fabric samples and magazine pages, we build ours using the visual — and emotional — stimuli encountered across our various expeditions. In a world obsessed with the "boutique hotel" aesthetic (our clients regularly ask for spaces that make them feel like they're on holiday) we find it easy to draw relevant cues from the places we stay. During a recent trip to The Kimpton Seafire Resort + Spa in Grand Cayman, for example, we were more than inspired by countless beautiful vignettes, gorgeous textures, appealing layers and, well, decorative inspiration at every turn. We've long since preached about "zoning" and the hotel lobby amply echoes this counsel. Smart sofa groupings, tall painted screens and shelves that positively heave with artifacts and stylebooks have huge impact. As does great colouration, a key aspect of the perfect aesthetic. It inspired us so much, in fact, that, during a recent Cityline segment, we recreated the space for our home-design-crazy TV audience. The cool blue tones of the lobby provide an impressive welcome. Our starting point? Ikea! We employed flat-fronted wardrobe doors (painted "Dark Royal Blue" using Benjamin Moore) connected by dollar-store hinges. Our set, dressed with cream sofas and cushions (harvested from Chapters Indigo and Homesense) generously alludes to the hotel foyer, right? Our overhead sculpture of driftwood (collected — free! — from the shoreline at Humber Bay) was inspired by the monolithic log sculpture that dominates The Kimpton cocktail bar, and it completes our cash-conscious "hotel homage." A crown of driftwood provides a textural canopy. For further inspiration, which will undoubtedly play across countless projects, we looked to the style of the hotel's bedrooms — relaxing worlds, suffused with a sunny Caribbean disposition. Walls are crisp white and panelled, with vibrant colour delivered via artwork and textiles. And take it from us: the rich shots of coral tones are very on trend: regulars at all the major design fairs, we're seeing coral, dark pinks and deep peach colouration everywhere. Being that dining room design amounts to around 30 per cent of our own output, it was fun to observe key trends being played at the beach. In Ave, The Kimpton's main dining room, swoon-worthy visuals prevail. Check out the stamped concrete floor, a clever geometric painted effect that resembles tile. This would be a great tactic to play in a concrete floored loft: rather than use wood, tile or berber, a stamped paint finish would be a wildly inexpensive alternative. Scope the range of wall stencils at Michaels art stores, any of which would work just as well at floor level. Protect with urethane (applied with a roller to avoid brush marks) and enjoy! Walls are clad in lightest wood, windows detailed with diaphanous voile whilst spun-glass pendants fly overhead like dramatic glassy birds. We enjoyed dinner below the beautiful fixtures on several occasions, prepared by Massimo De Francesca who studied at Toronto's Culinary Arts Programme, thereafter working with Michelin-starred Vincenzo Cammerucci on the Adriatic coast. Chef Massimo's menu consists of fresh local seafood and top-quality produce infused into coastal Mediterranean recipes. Design inspiration and world-class gastronomy in one place? What's not to like? But there was another reason for our recent trip: we recently decided to buy a fixer-upper holiday home in Cayman upon which to stamp our own mark. If we can get our ducks in a row, the project may even turn into a TV show, but more of that during another epistle. In the meantime, our photograph of the wrecked beach house will give you an idea of what we're after. Empty since 2004's Hurricane Ivan, we'd love to rebuild it. It would make a great home for "Lost Girl in a Tree" by Cayman artist Ren, a painting we bought on-island a couple of years past that depicts a scared girl, post storm, seeking safety, in a tree. Against a white backdrop, play aqua tones and shots of navy via textiles, drapery and cushions. Add an vintage leather tub chair to evoke that lovely Ralph Lauren vibe so redolent of the beach. Seek out wicker and bamboo bowls (Pier One has many) as well as rope-detailed trays and picture frames. Glass storm lamps are fun outdoors, but they're also fun indoors. Half fill with sand, bed in a chunky candle and let the atmospheric beach party begin! Blur the lines between outdoors and in — using colour cues from inside, add a textural rug in a similar palette to draw the eye to your deck or patio. Hang a decorative seaglass light fixture and let it twinkle like a starry coastal sky. Home Depot has various exterior options to fit the bill. As the weather wanes, there's still fun to be had outside. Add a patio heater or a gas-operated fire bowl from Canadian Tire. A few chunky throws from Ikea will baffle the dipping mercury even further!